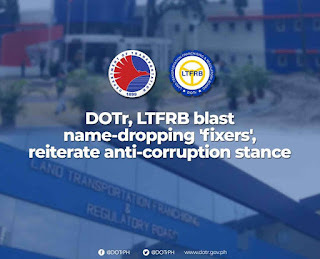 QUEZON CITY – Unwavering in the Duterte administration’s stance against corruption, the Department of Transportation (DOTr) and the Land Transportation Franchising and Regulatory Board (LTFRB) blasted the “name-dropping” modus operandi of several alleged fixers preying on transport operators in the guise of assisting them... in participating in the government’s Public Utility Vehicle Modernization Program (PUVMP). This comes on the heels of a letter sent to the LTFRB by the Liga ng Transportasyon at Operators sa Pilipinas (LTOP), supported by LTOP Board Resolution No. 10-24/2018. The group served notice to authorities and the general public on the activities of a certain Joseph Z. Abeleda, a former LTOP member who, together with a certain Robert Bacuyag and a Regevie Capalac, has been using the name of DOTr Secretary Arthur P. Tugade and LTFRB Chairman Martin B. Delgra III to convince transport operators to pay for the preparation of a technical survey and a route survey, as requirements for applying for franchises under the PUVMP process. In their letter and board resolution, LTOP alleged that Abeleda and his group have been name-dropping Secretary Tugade and Chairman Delgra, and claiming “payola” involving millions of pesos purportedly delivered to the Office of the Secretary (DOTr) and the Office of the Chairman (LTFRB). Abeleda and his group would then charge transport operators thousands of pesos to produce the so-called technical survey and route survey. Abeleda has been disowned by LTOP in light of his illegal activities with some resulting in criminal cases of “estafa” filed against him. Several members of a certain transport cooperative have previously attested under oath that Abeleda collected PhP30,000 of cooperative funds from them as payment for road rationalization evaluation and demographic engineering survey, with an assurance that they will be given franchises under the PUVMP with the help of his alleged connection inside DOTr and LTFRB. Meanwhile, a separate anonymous letter accused Abeleda and his group of playing “protectors” of colorum transport vehicles plying the Montalban to Cubao route, and that the group allegedly pays off LTFRB officials with PhP3,000 a month as protection money. Both Secretary Tugade and Chairman Delgra CATEGORICALLY DENY ANY CONNECTION OR INVOLVEMENT with Abeleda and his group. The officials have also strongly condemned the use of their names in this criminal activity. According to the DOTr and LTFRB, a route survey is not for sale, and does not serve as basis for a public utility vehicle (PUV) to ply a route. Instead, a route survey is conducted to see the potential of a particular route in terms of commuter demand and PUV supply. LTFRB further clarified that even if a particular transport group has requested for the opening of a certain route, no exclusivity is granted to the requester. If the route is eventually approved, it will be opened to all applicants subject to a pre-qualification process. 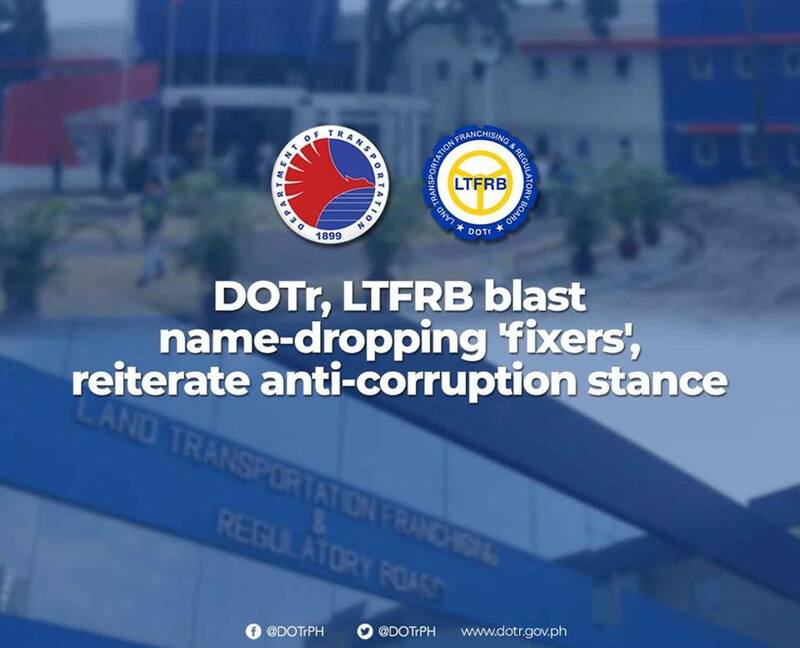 The DOTr and LTFRB reiterate their resolute stance against corruption in the public transport industry, fully supportive of President Rodrigo Duterte’s campaign for clean governance. For his part, LTFRB Chairman Delgra requests the public’s help in the fight against corruption by exposing personalities who demand monetary consideration for LTFRB services that are meant to be free of charge. “Walang bayad ang prankisa,” Chairman Delgra stressed.